My father came down to join me for a few days' ride through Mexico. Here we are approaching the border, 3 days from Phoenix, Arizona. One hundred miles from my home in Phoenix, Arizona, I found myself bicycling alongside an older gentleman, a naysayer. “You won’t make it today,” he said matter-of-factly. “It’s too far.” I had heard that before. After more than a year of cycling through 15 countries, today was my last day, the day I would finally roll into my family’s driveway, walk through the front door, hug whoever happened to be home and fall backwards onto the couch with my hands on my head and a smile of disbelief on my face. Home. I remember the first day of the tour, riding out of San Buenaventura, Paraguay, where I had been an environmental education volunteer for two years. My neighbors yelled in a mix of Spanish and Guarani from the roadside, “Dondepiko te vas en esa kavajupiru?” Where the heck are you going on that skinny horse? I had mostly kept the tour a secret during the last year of planning in order to maintain credibility in my Peace Corps site, because certainly attempting to bicycle from South America to North America meant I was either insane or a liar. But now there was nothing to lose. I told them I was going to the United States. People are great worriers. If I had burned a pile of cash and said my plan was to go live in an abandoned bus in the Alaskan wilderness while foraging for wild potatoes, they might have had real reason to worry. 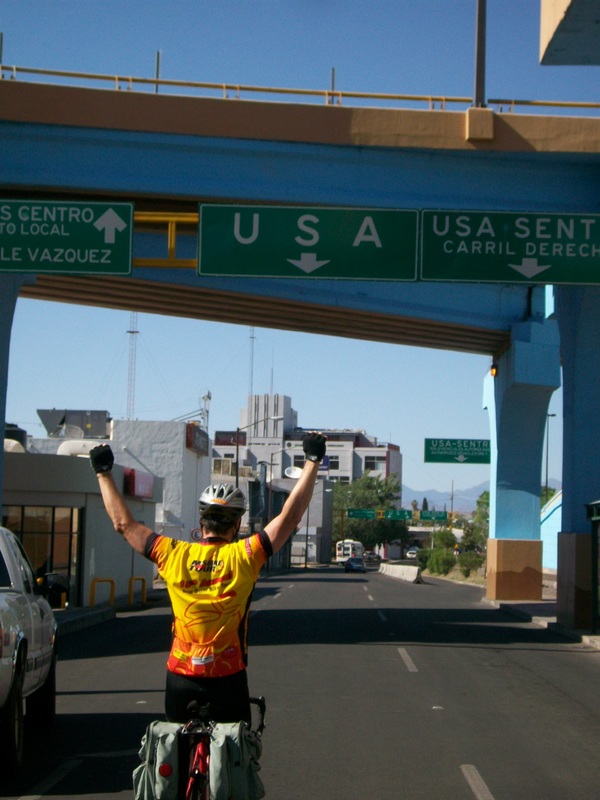 But my plan was to bicycle from Paraguay to Arizona, immerse myself in every culture along the way, interview locals about environmental and social issues, write about it on a website, and raise as much money and awareness as possible to support conservation efforts in Paraguay’s endangered San Rafael Reserve. This was my dream. In terms of risks vs. dreams, it’s your call. The naysayers don’t know how long the idea has been bouncing around in your head, or when dreaming began to transform into hoping, thinking, reading, planning, and discussing. Nobody knows how determined you are, possibly not even yourself, until you find yourself in a moment of sheer determination. They don’t know whether or not you are one of those people who is willing to risk, and even relish, the great unknown in order to live as much as possible before you die. To be fair, I think sometimes their biggest worry is that they do know how much you are willing to risk, and they fear it is too much. For a lot of people, when confronted with the possibility of the unknown it is easier to avoid it, to keep the same job, continue eating the same foods and shopping at the same stores, or any of the myriad of other comfort routines. And if they’re content and not harming anybody, who am I to say they’re doing anything wrong? As for me, for better or worse, I did not feel content with such a lifestyle. I had reason to believe I actually was harming others, a lot of others. Sure, I volunteered with some non-profits from time to time, but overall I was living a life that supported people who need support the least while exploiting those who need support the most. Plus, too much comfort makes me uncomfortable. I didn’t have the answers to the questions about the unknown; I knew there were some dangers –though much less than my friends and family thought– but by now I knew I was willing to risk the unknown in order to try to live as fully as the authors of the inspirational stories I had been reading. Congrats Sam! I never thought you’d make it. Very impressive.